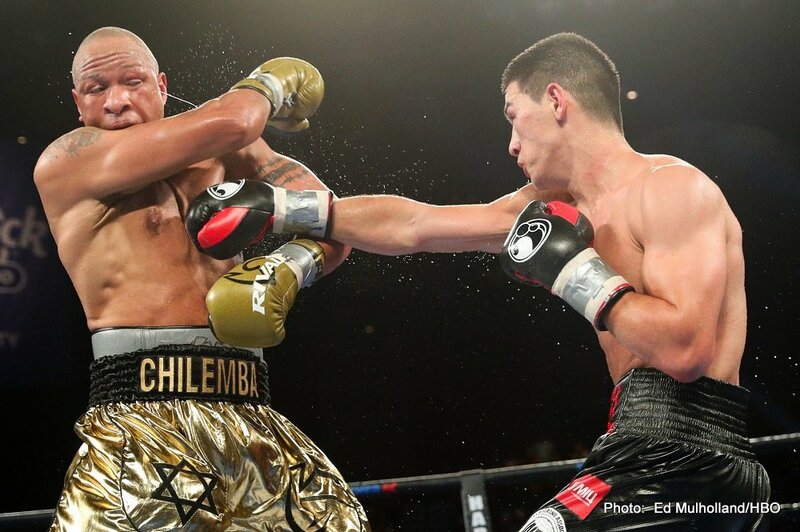 WBA World light heavyweight champion Dmitry Bivol (14-0, 11 KOs) used his superior offense armament to defeat veteran Isaac Chilemba (25-6-2, 10 KOs) by a lackluster 12 round unanimous decision on Saturday night at the Hard Rock Hotel & Casino in Atlantic City, New Jersey. Two of the judges didn’t think much of Chilemba’s lack of effort in trying to win the fight, as they scored it 120-108 and 120-108. The third judge scored it 116-112. That was score quite bad because Chilemba did not win four rounds in the fight. The issue was never in doubt for the 27-year-old Bivol. Chilemba didn’t have the firepower to do much other than land shots here and there. Unlike Bivol’s previous fight against Sullivan Barrera, he never put in an effort to try and stop Chilemba. Once Bivol realized that Chilemba was just trying to survive by boxing, he opted to box him to win the 12 round after instead of going all out for the knockout. Bivol likely could have stopped Chilemba if he been prepared to chase him around the ring, but it would have been messy and he would have looked bad. Chilemba was using too a lot of head movement to dodge Bivol’ shots, making it difficult to hit him squarely. The 9th and 10th rounds saw the most action of the fight, as Chilemba started coming forward more looking to land his shot. Chilemba had done little up to that point in the fight to make the fight interesting. In the 11th and 12th, Chilemba went back to playing it safe by looking to avoid Bivol’s harder shots. It’s unfortunate that Chilemba’s corner couldn’t motivate him to go on the attack more, because this is likely he last chance he’ll get to ever fight for a world title. The loss last night was Chilemba’s fourth in his last five fights, which is an embarrassingly bad record for a world title challenger. Bivol’s promoters had their reasons for having him defend against a fighter with a 1-3 record in his last four fights. It would be a bad look for Bivol’s career if his promoters continue to feed horrible opposition like this, because it made him look bad in putting him in with a guy just looking to survive like Chilemba. If Bivol’s management had done any research of some of Chilemba’s past fights against Sergey Kovalev and Tony Bellew, they would have understood that he mainly just spoils and tries to make his opponents look bad without putting much effort into winning his fights. This fight was never going to be a good one for Bivol. Even if he had gone all out looking to stop Chilemba, he was never going to look good against him because he’s too much of a defensive-minded fighter. Hopefully for Bivol’s sake his management will start looking closely at potential opponents in the future and focus on matching him against guys that come to fight and are more exciting. Putting Bivol in with spoilers like Chilemba is always going to result in him looking bad like he did last Saturday night. Chilemba seemed to have a sour grapes outlook about the fight afterwards, feeling that he should have had his hand raised by a 116-112 score. “I believe I won every round from the fifth,” Chilemba said. ”I pushed Bivol backwards and made him miss. I deserve a rematch,” Chilemba said. fighting like a sparring partner trying to survive for 12 rounds to give the champion rounds. That’s what you get when promoters like Bivol’s match him against fighters with three loses in their last four fights. You get the sparring partner type of opponent, and they end up stinking up the joint. Before last night’s fight, Bivol wanted to fight WBO light heavyweight champion Sergey ‘Krusher’ Kovalev in a unification fight later this year. With Kovalev’s 7th round knockout loss to challenger Eleider Alvarez last Saturday night, a Kovalev-Bivol fight is not going to happen unless promoters Main Events wants Bivol to defend against Kovalev in a voluntary title defense. It would be better for Bivol to go in another direction by facing another world champion like IBF champ Artur Beterbiev, Eleider Alvarez or Adonis Stevenson. It’s unlikely Bivol’s management will want to put him in with any of those guys off the back of his performance against Chilemba because he didn’t look good against him. Bivol needs to improve his defensive skills before he faces the likes of Beterbiev, Alvarez or Stevenson. Bivol would have a good chance of beating all of them if he could deal with their punching power and pressure, but the fights would be a lot more difficult for him than what we saw last night. That’s why it’s better than Bivol’s management not waste his time in having him fight spoilers like Chilemba. He needs to fight guys that are trying to win the fight, not fighters that are just trying to go the 12 rounds like Chilemba.